Bruce is hosting Seven’s coverage of Golden Slipper race day at Sydney’s Rosehill Racecourse tomorrow, so he must have been preparing and conducting interviews today. I notice Seven has added faces next to commentators’ names when they are listed above score graphics. Would they overwork Bruce by getting him to call Sunday alongside Basil (as the game is at the stadium whose naming rights now belong to the home team)? I wonder then who was the main caller, BT or JB? I like how they have included umpires into the commentary this season! A pop-up (which was in colour including the AFL logo and stretched across the bottom of the screen) appeared on 7mate on Thursday around 7:50pm, advising viewers of the “AFL” and to “switch now”. 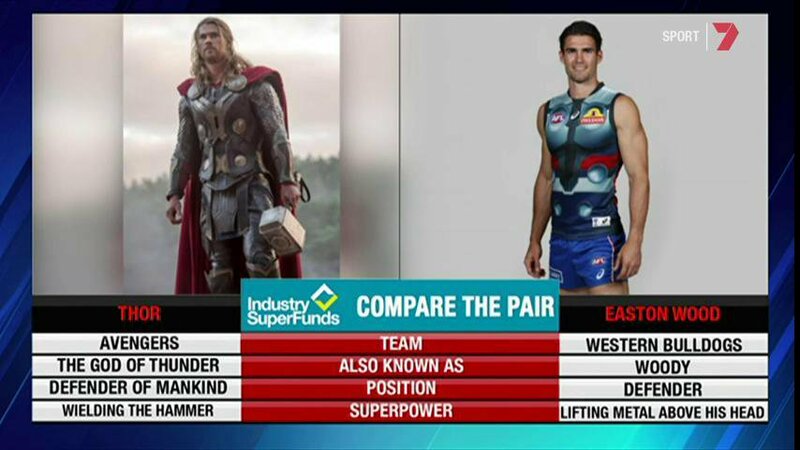 Seven do a much better job than other networks with these, even in non-AFL markets. Even recall seeing someone show/comment here last year a ‘Sydney Swans’ themed one. @Bort and @JBar recently commented about Seven’s PRGs that they’re quite good. After the AFLW Semi-Final between Carlton v Fremantle, WA viewers went to watching the replay of the 2018 AFL Grand Final between West Coast Eagles and Collingwood on Seven. Again, what a great match. 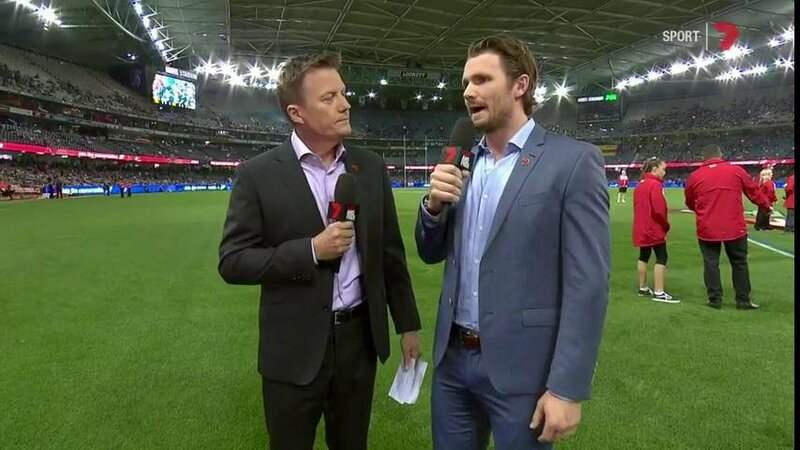 Geelong star Patrick Dangerfield is joining The Kick and then Western Bulldogs v Sydney at Marvel Stadium tonight. He did a live chat with Jacqueline Felgate during the Melbourne bulletin earlier. 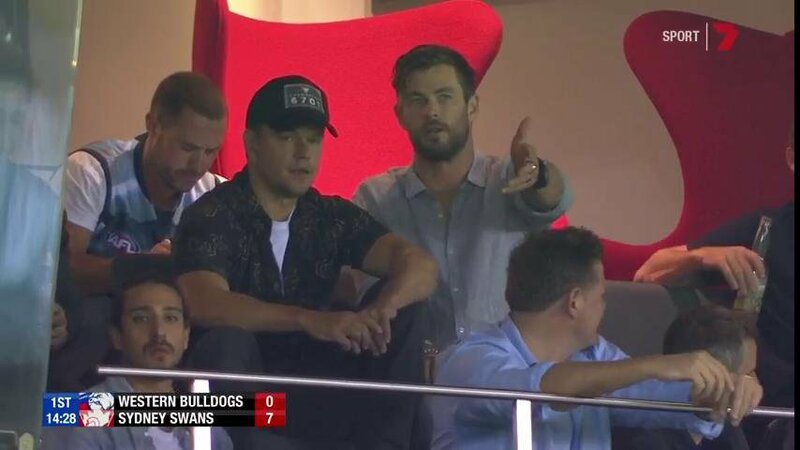 Matt Damon and Chris Hemsworth watching the match. Is the scores in the top left corner a new thing from 7 or did they have it last year as well? a new thing, just like the cricket the summer just gone. Thanks its a really nice addition. 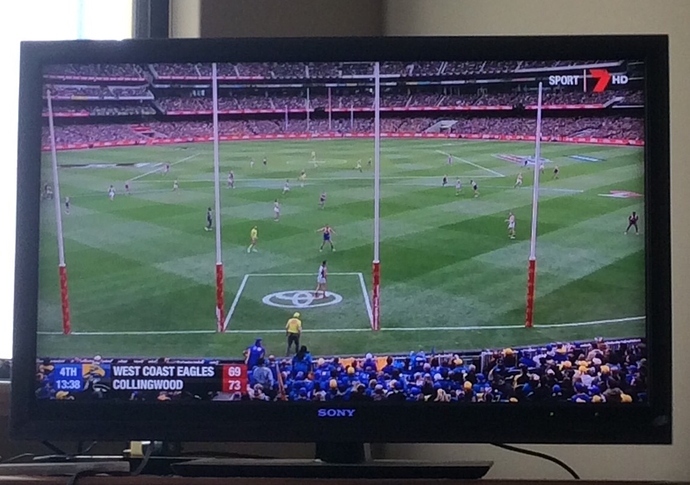 Because of the changes to the EPG with listing a seperate “Post Game”, this is now available on 7Plus to live stream. Previously it was blocked by Border international as part of the one “AFL” listing. Something for viewers I guess. Tonight’s telecast finished at 11:09pm (AEDT). Taken photos of the gf replay last year. During the replay, there were ads during goal breaks. Bit confused about the new Kayo platform when it comes to the AFL rights, as Telstra (“Telstra Live AFL app/website”) have exclusivity for live streaming I thought? My guess was Kayo is a seperate paid subscription for live streaming, not available to existing Foxtel subscribers (sat/cbl/Now/Go)? I have a slim Foxtel Now subscription and signed up for the free month of Kayo. I wasn’t barred just because I already have Foxtel. While on the surface doesn’t seem big at all and could be scoffed at, its notable as Brisbane Lions beat the reigning premieres West Coast in a monumental upset (let’s be honest), hope the tides are changing there. After some very tumultuous years. 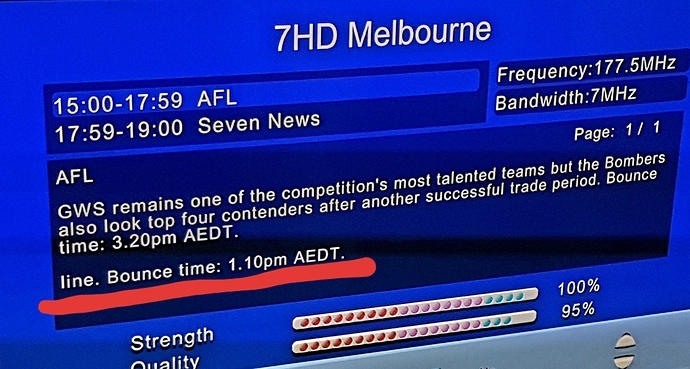 Something that is noteworthy, it beat Channel 9’s movie (and Dynasties by the looks of “pre match” and remembering a game is ~2.5 to 3 hours for one coding) and Channel 10’s Ambulance repeat and movie ! I think it helps they are playing a lot better footy (that being the Lions). If the Lions can climb up the ladder perhaps there will be growth in viewership. I am hoping that the crowds improve more though. 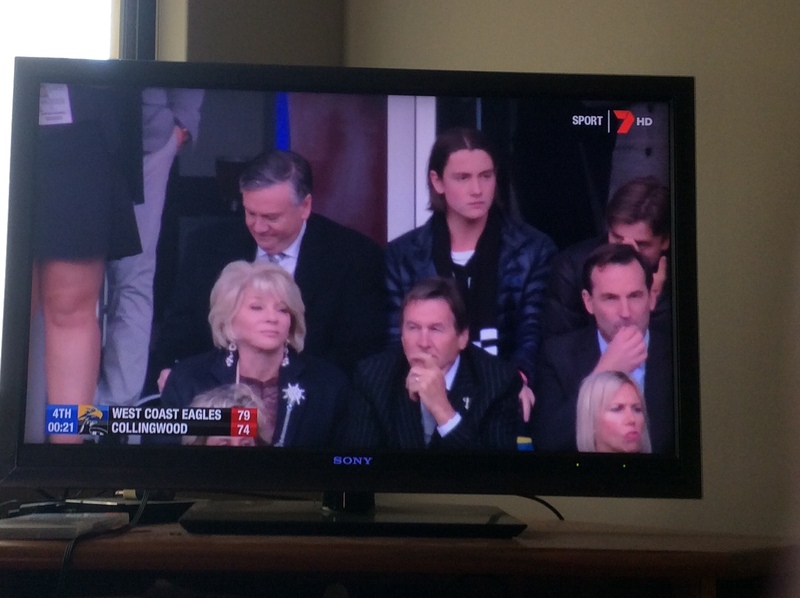 Richo was boundary reporter for Western Bulldogs v Sydney last night. Yes, Bruce and Basil are calling today’s match between GWS and Essendon.